Millions of years before February The Fifth, Gloth was making a nice little profit from the planet Erde, with the help of some cunning Popes and the very, very secret Camera Stellata, sometimes better known as the Star Chamber. Being disowned by his father and booted out of his family manor in England, then transported off to the distant sun-drenched shores of Australia didn’t sound like such a bad punishment for Hal. All things considered. Sydney however, didn’t prove to be his cup of tea, but a quick move to Brisbane leads Hal to a wonderful new life full of friends, backyards, barbeques, beer, surfing, The Breakfast Creek Hotel and Narelle. For a short time unfortunately as so often happens, just when you think things are beautifully perfect, someone or something comes along to throw a spanner in the works. In Hal’s case, his idyllic life gets hit by a number of airborne wrenches. Then when he thinks things are about as bad as they can get, they, of course, get a whole lot worse. Afflicted by an allergic reaction to dust and scary things, Hal does a lot of sneezing as he goes about trying to make the whole lot worse a whole lot better. It’s a mad world on Gloth as experienced through the eyes of Halbert Hoop, Hal to the reader. Hal is a well-developed character who gets himself into unusual and kooky situations. It’s great fun for the reader to share Hal’s strategies in unraveling and solving these situations. 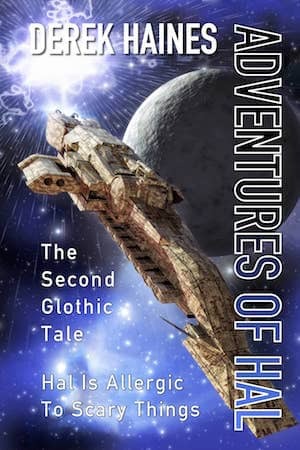 Hal’s adventures arriving and living on Gloth are unpredictable and fun to read. The characters he meets are as unique as the menu items he consumed in order to survive. Hal’s quest to return to Erde, better known as Earth is driven by . . . There is no way I will spoil the story, the unpredictability is the best part of the book! I recommend Hal for readers who enjoy whacky characters and crazy places. 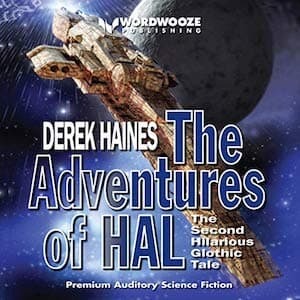 It’s an enjoyable story and once again, Derek Haines strength in developing his characters is terrific. Have you ever pondered the exact meaning of the words human and god? Well in the whacky world of Gloth, human stands for – Hybridised Uniform Manipulation And Naturalisation, while god simply means – Glothic Oversight Detachment. What did you think it meant? While this may come as a deep shock to those Erdeans – sorry Earthlings, of a naturally delicate disposition, take it from me, you ain’t seen anything yet! I feel sorry for the illustrious members of the Camera Stellata, especially when poor Lord Ashtoke meets the real power behind Erde (Earth). Is it any wonder the man dies of a heart attack? And now we come to the subject of this book, Halbert Hoop – HAL for short. Yikes Derek, have you completely lost your senses man! Hal becomes a member of the Camera Stellata? Surely you jest! Never was there a more unlikely candidate for great things than the bumbling, gangly, accident prone Halbert Hoop. To console myself from the shock of this ghastly revelation, I turn your attention and mine to the extremely important subject of Glothic cuisine. All of the above served with a glass or two of Fozzoxly, the Glothic equivalent of pure nectar. Sadly the contents of the menu above are simply too good for the likes of common Erdeans such as you and I. Before you think I have totally gone mad, why not read “HAL” for yourself. This hilarious sequel to “February the Fifth” shows Derek Haines at his absolute best. Now available in audiobook from Amazon, Audible and coming soon to iTunes!